Commercial drones represent a serious security risk to major public events, but also to sensitive infrastructures and facilities such as industrial testing grounds, large industrial plants, critical infrastructure, military and even correctional facilities. Of particular risk is the unauthorized use of micro unmanned air vehicles (MAVs) for espionage, provocation or even criminal and terrorist purposes. How serious is this threat? What are the current range of detection and mitigation techniques? Join us on Thursday, November 16 at 1:00 PM EST when our panel of experts will address the current state of the science in Drone Defense in a FREE web seminar sponsored by Rohde & Schwarz. Our panel of experts for this exciting event are Ross Lamm, Co-Founder, Black Sage Technologies; Goetz Mayser, Director C-UAV Detection and Counter Solutions, Rohde & Schwarz, Inc.; and David A. Romero, Managing Partner, Black Sage Technologies. The webinar moderator will be General Jim Poss, CEO of ISR Ideas, an intelligence, unmanned aerial systems and cyber consulting firm. During the live event, audience members will have the opportunity to pose their own questions to the panel of experts. David A. Romero is a managing partner at Black Sage, a defense company solving time sensitive problems relating to national security and terrorism. He is a futurist who bridges skills in high tech with business strategy; and is a champion for technology vision and quality. Prior to shifting his efforts full time to developing Black Sage in 2014, he operated an international data science company deploying predictive analytics systems to aid governments in data driven policy making. 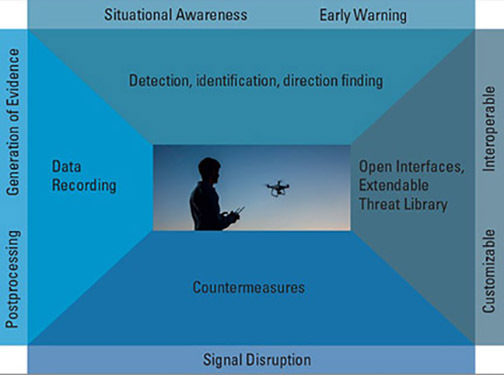 Dave has been referenced in Associated Press, IEEE Spectrum and Janes Defence on Counter – Unmanned Aerial Systems (C-UAS) and in a Wired Magazine feature story on methods for stopping drone terrorism. In addition to work in national security, Dave is passionate about cultural diplomacy and served as an emissary in India for Rotary International. He’s lived in South America, Oceania and Southeast Asia and motorcycled tens of thousands of miles on foreign backcountry roads. Ross D. Lamm, Ph.D, managing partner, obtained his Ph.D in Image Processing and Machine Vision from UC Davis in 2000. He develops products and solutions that include long range video tracking as well as gyro-stabilization and radar slewing of camera systems. His solutions have been used for long range surveillance in such places as Iraq, Afghanistan, Somalia, Jordan and Washington D.C.
James Poss, Maj Gen (Ret) is the CEO of ISR Ideas, an intelligence, unmanned aerial systems and cyber warfare consulting firm. He is the founder and former Executive Director of the Alliance for System Safety of UAS through Research Excellence (ASSURE), the FAA’s center of excellence for unmanned research. He is a 30-year U.S. Air Force veteran with combat experience in four wars and was the Air Force’s senior career intelligence officer at his transition from active service in March 2013. He is a leading expert on UAS having helped designed the U.S. Air Force’s remote split operations system for UAS control and the Distributed Common Ground Station for UAS intelligence analysis. Gen Poss also has extensive experience in cyber operations from his assignments with the National Security Agency and as the Air Force lead for stand up of U.S. Cyber Command. He is the 2012 winner of Aviation Weeks’ Curtis Sword Award for his leadership in Anglo-American aerospace relations.